Recently I was looking up the types of models that kids used to make when model and hobby stores existed, and came across an advertisement for a curious looking contraption called the VAC-U-FORM. I'd never heard of it before, but basically it was a toy (albeit one that had to be used with caution) that kids (and adults) could use to make...other toys. Whoa. Knock me over with a feather; this thing looked like it was a blast! 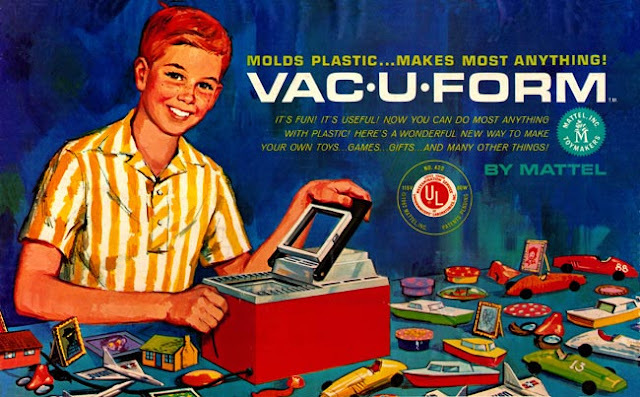 The VAC-U-FORM was manufactured by Mattel (you can tell it's Mattel; it's swell) in the early '60s and used the industrial process known as vacuum forming to make plastic molds on a small scale. The machine came with several plastic sheets in a variety of colors. The user would insert a sheet of plastic in a metal holder which got heated over a metal plate. When the plastic got soft and malleable, the holder was swung to the other side where a mold of a desired object was waiting for it. The user would press a handle on the side of the toy that created the vacuum and pressed the plastic over the mold. The shaped plastic would solidify and cool and voila -- you've got yourself a plastic toy, or a part that would be used to create one. 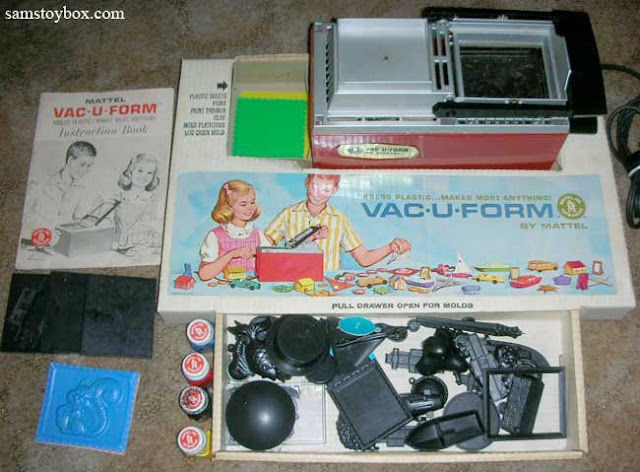 The VAC-U-FORM came with several molds, but additional ones could be purchased separately, and any solid object that could withstand the high temperature and hot plastic could realistically be used as a mold. Of course, a toy like this would be considered dangerous today, as there were exposed hot surfaces that a child or grown-up could burn themselves on. 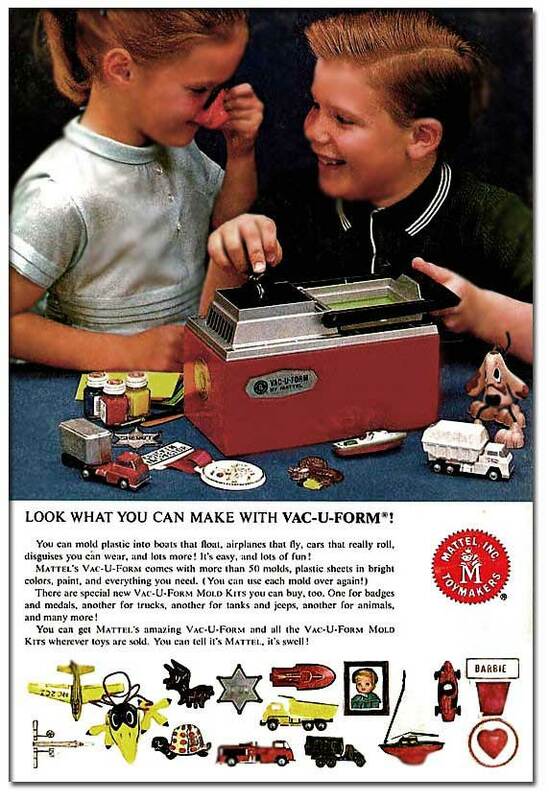 While Mattel discontinued the product at some point, another company called ToyMax produced its own version, called the VAC-U-FORMER, in the 1990s. Their version was a little safer as it replaced the hot plate with a light bulb, similar to what's found in an Easy Bake Oven. Both products appear to be readily available on eBay, with prices ranging from $30 for just the machine itself to $100 for an unused complete kit. Wikipedia says many are still in use today, particularly by hobbyists that use the product to make parts for their own crafts. Verry interesting! Pam, you just gave me a flashback to another one of these "hot" toys they'd never sell to kids today, Mattel's "Creepy Crawlie Thing Maker"--you poured some kind of goop into various bug & monster molds on a hot plate, in the 3rd grade I wanted one in the worst way & my mom absolutely refused--and sure enough, a week or so after Christmas my neighbor (and classmate) Hope invited me over--TO SEE HERS! A girl--a GIRL with a creepy-crawlie thing maker! I gotta see if one of those are on Youtube too :) Thanks & Merry Christmas Go Retro! 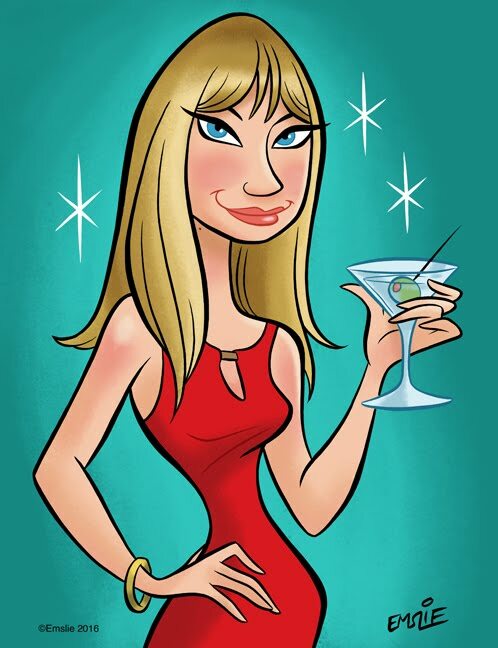 Thanks, Doug! The Thing Maker was indeed pretty similar to this toy and recently was included in a video I posted to the GR Facebook page listing the most dangerous toys of the '60s (because of the chemicals used and the fumes they gave off.) I saw in the comments on YouTube that the VAC-U-FORM gave off fumes, too, as the plastic melted. Sorry to hear you never got a creepy crawler thing maker of your own, but that's cool that your female neighbor got one...and I hope she let you make a few bugs with it. Merry Christmas to you as well, Doug! Doug, I had one of those Creep Crawler makers when I was a lad. It was a blast! My brother and I played with it for hours. I can't remember what happened to it. Also nobody got hurt. Ahh the memories! !